Our curriculum is based on the teachings of master Johannes Liechtenauer, a 14th century fencing master. His teachings were passed on to later masters such as Hans Talhoffer, Paulas Kal, Joachim Meyer, and many more. Later masters add their own commentaries as well as new techniques and weapons to their manuals. Beginner classes focus on the two-handed longsword, wrestling, and dagger. Students will learn the basic mechanics of how to fight like a Medieval knight, the 5 Meisterhau (Master Cuts), and begin controlled sparring. Intermediate classes focus on training a deeper knowledge of the material learned as a beginner. Classes spend more time on advanced response drills and free sparring. We will also delve more into the other weapons of the system, such as staff, poleaxe, messer, and more. While the school does not have a complicated belt system like many Eastern martial arts systems, we do have a basic rank system based on the school's curriculum. The ranks are: Student, Novice, Scholar, and Free Scholar. The student is anyone starting their journey into historic martial arts. 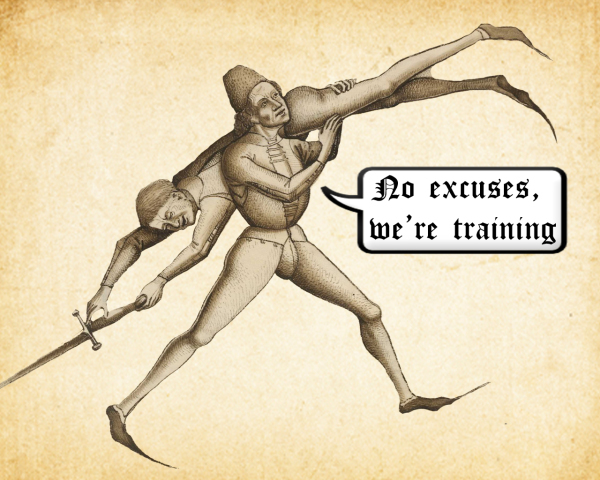 The Novice is expected to understand and execute the fundamentals of the longsword, dagger, and wrestling. The Scholar is expected to also apply their training to the single handed sword and long weapons. The Free Scholar must know all weapons and wrestling, in addition to armored and unarmored combat. Thank you for visiting our page. We hope to see you in class soon!